Bring these Gingerbread Mailmen to a holiday cookie exchange and they’ll be a hit with dog owners. 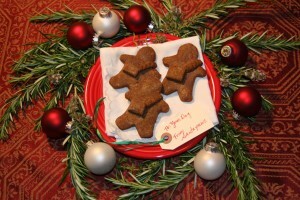 These cookies are also a creative way to provide a healthy dose of antioxidants for your dogs. The cinnamon and ginger provide unique antioxidants not found in commercial foods while the molasses provides sweetness and a healthy dose of vitamins and minerals. Spray a cookie sheet with non-stick cooking spray. Roll dough out on a lightly floured surface to 10”x10”. Cut with a cookie cutter and place onto cookie sheet, separated by ½ inch. Roll remaining dough and cut with a knife to make pouches and shoulder straps. Bake for 25 minutes or until crisp and dry. Allow the cookies to cool on the baking sheet, then store in an airtight container for up to one week or in the freezer for up to 2 months. Makes about 16 gingerbread for a small cookie cutter or 100 cookies if you cut in in squares.